Click on play button to listen high quality(320 Kbps) mp3 of "BAD vs. Turn Up The Speakers vs. Terror Squad (Afrojack UMF 17 Mashup)". This audio song duration is 3:09 minutes. This song is sing by BAD vs. 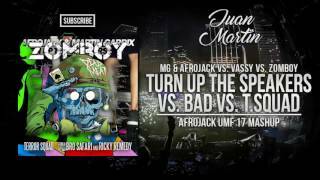 Turn Up The Speakers vs. Terror Squad (Afrojack UMF 17 Mashup). You can download BAD vs. Turn Up The Speakers vs. Terror Squad (Afrojack UMF 17 Mashup) high quality audio by clicking on "Download Mp3" button.